The first result (which I will not link to) is a post that has nothing to do with le Tour. It is a site promoting DVR software for your Mac. Unfortunately this will probably get worse as the Tour progresses. Blogspotting is facing an onslaught of trackback spam. For now, it’s easy to detect, but not for long. 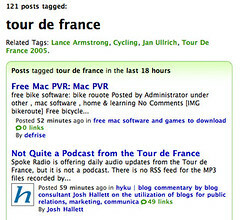 What kind of bike blog would this be if I didn’t mention the Tour de France? And what kind of blogger would I be if I didn’t mention Tour tag spam on Technorati?